Given that, it’s rather noteworthy that as the executive branch of the U.S. federal government withdraws from the Paris Accords and removes climate-change-related references and archival research documents from the Environmental Protection Agency’s web pages, these two European religious leaders are quoting Scripture and scientific-moral consensus in virtually the same breath. Of course, Ecumenical Patriarch Bartholomew has been emphasizing the importance of Creation for nearly three decades, and it was his predecessor Demetrios I who designated September 1 as the World Day of Prayer for Creation (starting in 1989). Pope Francis brought the Catholic Church on board for this liturgical-calendrical signification in 2015, two months after Laudato Si’ was released and several weeks before he addressed the United Nations, where he implored world leaders to reach an international accord on pressing matters of social and environmental degradation. 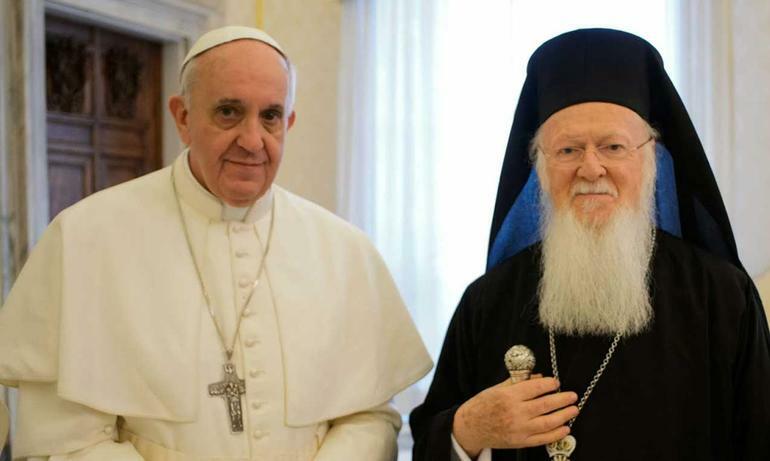 But what do the Pope and Ecumenical Patriarch mean to elicit with this September 1 document, a “Joint Message on the World Day of Prayer for Creation”? Is it merely an exhortation to prayer, since after all in the fourth paragraph they invite “all people of goodwill” (a classic formulation in Catholic papal encyclicals) to “dedicate a time of prayer for the environment”? Indeed, given the severity of the climate-change-related “morally decaying scenario” they depict, one can reasonably wonder whether “prayer” is really a sufficient call to action. Ethics, I tell my students, is about how we humans relate to the world. It requires both reflection and action. The theology of prayer in this document is not singularly about meditation or supplication. It is about spiritual orientation towards right forms of action. And the actions required are resolutely collective in this historical moment characterized by climate change and soaring inequalities. The Pope and the Ecumenical Patriarch therefore conclude the address with a focused “appeal to those in positions of social and economic, as well as political and cultural, responsibility to hear the cry of the earth and to attend to the needs of the marginalized”—again, language that resonates strongly with Laudato Si’ and prior Catholic Social Teaching. Then, intriguingly, they add an additional exhortation: “above all to respond to the plea of millions and support the consensus of the world,” with a “concerted and collective” response, with responsibility that is “shared and accountable,” oriented towards “solidarity and service.” While I will be the first to tell you that magisterial and Orthodox statements are surely not given to responding to particular government policies, in this case I would argue that a—if not the—critical target in the last paragraph of the Joint Message is the U.S. withdrawal from the Paris Climate Accords under President Trump. In sum: this pithy, potent, and all-too-timely Joint Message from Pope Francis and Ecumenical Patriarch Bartholomew is both steeped in tradition and fiercely contemporary. It is up to communities of Christians and “people of goodwill” to decide whether and how such insights can catalyze the turn to a new chapter in humanity’s relationship with climate change—that is, to embrace to forms of efficacious, collective action on planetary degradation—or whether this will simply be a well-phrased bookmark in the narrative march of prayer and reflection, full of sound and worry, ushering in nothing.